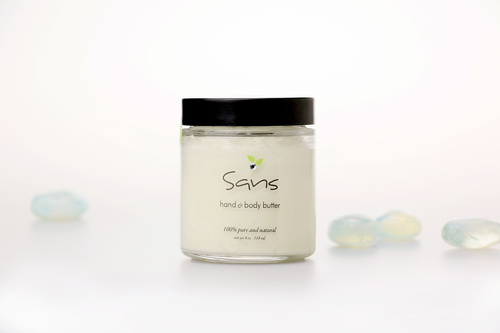 Made with amazing pure and natural ingredients, the smoothness and silkiness of the Whipped Hand & Body Butter is unlike anything else. While commercial creams are predominately water, about 70-80%, we choose not to use any water in our butters (because when there is water in a product there HAS to be a preservative added to preserve it, and there are no really all-natural preservatives). This means you get the pure concentrated plant oils and butters without anything synthetic or any harmful chemicals. So wholesome and good for you, the skin just drinks it up, and the moisturizing effects will stay with you all day. Once you've used plant extracts, you will be hooked! Available in 5 natural scents: Lavender, Tahitian Gardenia, Lemongrass, Sweet Orange, and Unscented. Use morning, night, and throughout the day as needed. The best time to use this butter is right after a shower when the skin is warm and the pores are open. Since this butter contains no water as a filler, the butter is very concentrated. Use very little, if it feels too greasy then you've used too much. Your skin will tell you just how much to use. Avoid getting into eyes. Avoid getting water or wet fingers into the jar. Ingredients: Hemp Seed Butter, Horsetail Butter, Rice Bran Oil, Apricot Kernel Oil, CoQ10, Vitamin E Tocopherols, Carrot Seed Oil, Rosemary Oil, and Fruit and Flower Essential Oils for scent.